What happens after the aircraft and your life come to a complete stop? You start over in a far-away land. 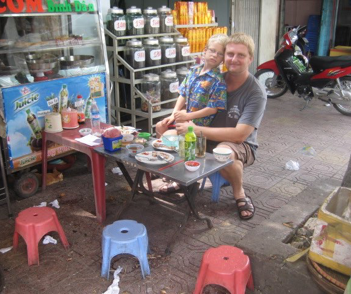 When the Great Recession obliterated our jobs and savings, my husband, son, and I sold everything and went to live in Vietnam—a place I knew we could live cheaply, earn some fast money teaching English, and eat crazy-delicious cuisine. In this timely, humorous memoir, I describe our relocation to a crowded alley in a poorer district of Ho Chi Minh City. We moved our remaining material possessions into a 9-foot-wide house with beach chairs as furniture, an obnoxious rooster next door, bugs as big as rats (oh, wait, those were rats) and no hot water. We were the first foreigners to move into this part of town, so the neighbors couldn’t help but stare unabashedly through our windows as we set up house. 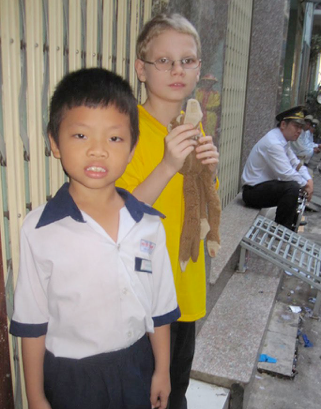 Children followed us as we walked around, housewives peered into my shopping basket after a trip to the market, and grandmas touched our son Kai’s blond hair and pinched his cheeks. People giggled as my 6-foot-4, 250-pound husband tried to sit on the tiny plastic stools next to foot-high tables set up at local food stalls. We amused them. They enchanted us. Many tourists to Vietnam say the people are some of the world’s friendliest. It is my hope that my story of living with the Vietnamese will help shine a new spotlight on the country in a way that war stories and history books haven’t.